So I have about three blog posts written in my head that just haven’t made it on here yet – mainly because we were too busy enjoying the summer holidays before school kicked in, and then school started and it’s been a bit manic getting used to new routines. So here is the first post which is a follow-on from my last one about Lucia’s compression. I was totally overwhelmed by the response I got and cannot thank everyone enough for all of the invaluable advice and support we received both in the comments and by email. 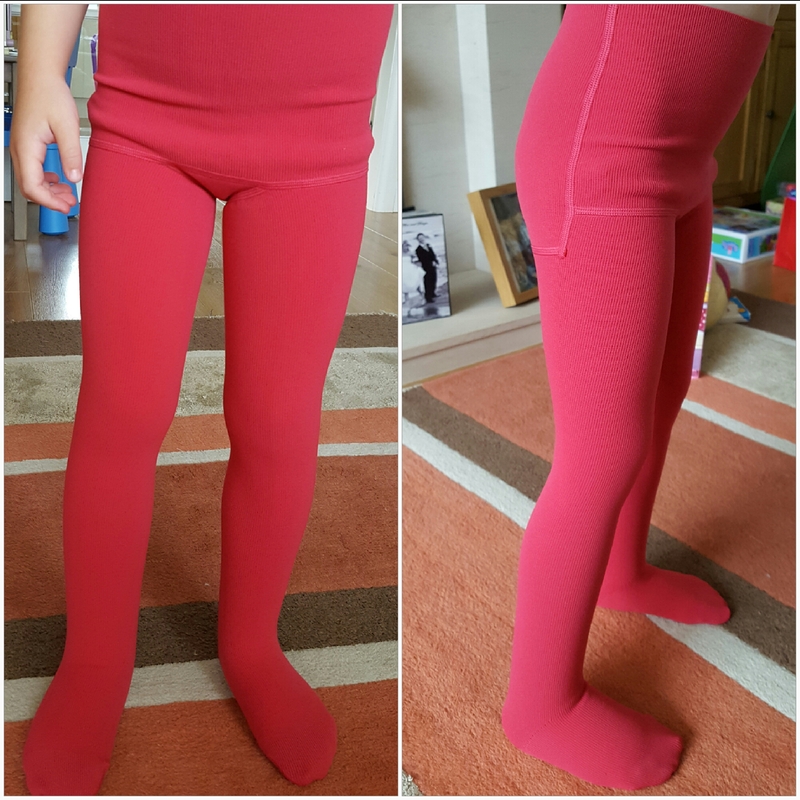 As you are aware we’d been struggling to find the right compression garments for Lucia and were getting increasingly frustrated as the months went by, because we kept getting let down with ill-fitting garments from our previous company. So we decided to try a different company – and we are now in a much happier place. Enter Juzo. 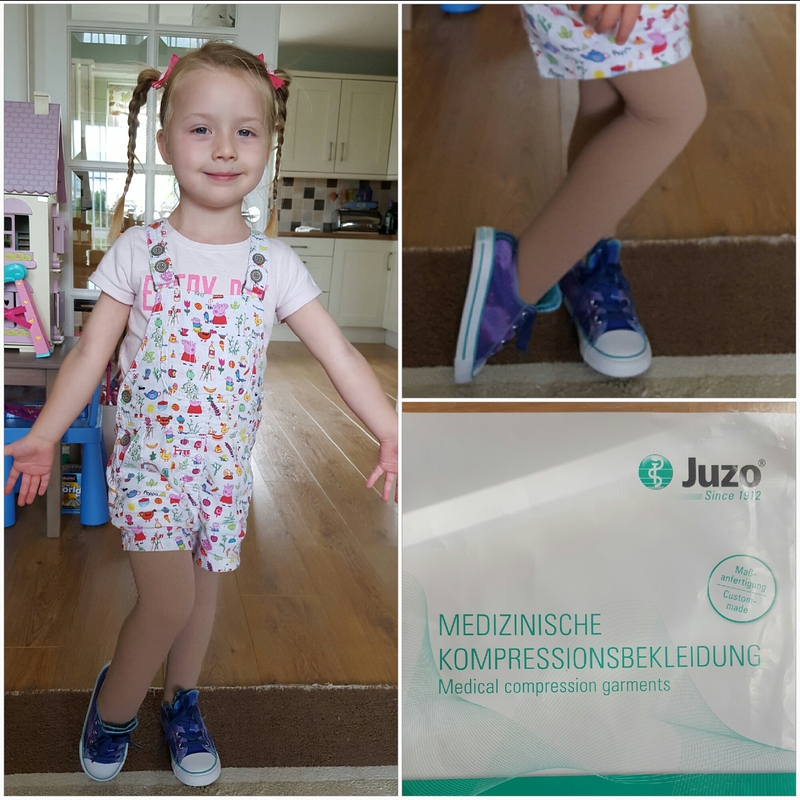 Juzo was not a company we had tried before but we had a good look through all of their different types of garments, chose a pair that didn’t seem too thick or heavy and got Lucia all measured up. Unfortunately however, the type we had picked couldn’t be made in Lucia’s small size so instead they suggested Juzo Expert range. To begin with, I’d like to say how amazing their customer service is – they were in constant contact with Lynne and with the pharmacy every step of the way so we knew exactly what was happening and when we would be receiving the garments. And then they arrived. In all honesty my first impressions were a bit, ‘Oh no, they seem very heavy and ribby’ because previously we had been used to much lighter, smooth compression. However, these new garments were flat knit as opposed to circular knit, so they were always going to be different. But they were impeccably made – you could see the time and effort that had went into making them, just for Lucia, and the quality was fantastic. I also found out that Juzo’s quality control is stringent and the first pair made for Lucia didn’t pass – so it is good to know how strict they are at ensuring everyone gets exactly what they need. For the first 10 days or so after receiving them, Lucia point blank refused to let us put the tights on her. And when Lucia has her mind made up it takes A LOT to change it. She just said, ‘they weren’t her tights’ and I can see see where she was coming from as they were very different to what she had been used to. However, after much talking (and bribery, obviously!) we finally got her to agree to try them on. The first fitting took almost half an hour (and two sore shoulders on my part) to get them on! But this meant that a) we were learning how to fit new garments and b) they were excellent compression – and we got there in the end. The fit was brilliant. I know this might sound like a daft statement but they really were made for her. They fitted her everywhere to a tee. They fitted her feet so no squashed toes, the leg length was right so no gathering at the tops of her thighs, they came up far enough but not too far on her belly, there was no gaping waistband – they were brilliant. And most importantly, Lucia said they were ‘comfortable’. Once they were on Lucia did also say they were very tight, but the little super star managed them for about two hours on the first day before wanting them off. They we just slowly built up her time in them day-by-day until after a week or so she was able to manage them for between 8-10 hours each day. And once we could see she could handle them and how beautifully they fitted we ordered another pair – both in ‘almond’ which is a sort of beige. We finally had made a break through and the relief was ureal! And when we tried them with her uniform they looked perfect – and because they have that slight rib they just look like ‘normal’ little girls school tights. I have never been so happy! (Combined with the red in her uniform they pass as red but they also look more pink with other clothes, so they are pretty versatile.) I’m keeping the gorgeous photos of her in her uniform for the next post but the above photo shows the lovely colour and fit. So finally, after months and months of stress, worry and fears it feels like a massive weight has been lifted from our shoulders. It’s only when something finally works out that you often realise just how much anxiety you are holding onto – and when that anxiety is about the welfare of your daughter and her medical condition it is understandably pretty huge. But now we are in a great place compression wise and Juzo are my absolute heroes right now. Thanks Susie, we are so happy it has all finally worked out! Thank you Jo-anne and Lucia for sharing. The stockings look great – so glad you have found a company to meet your needs at this stage. As a new-ish therapist, it is so good to hear about how people need to slowly build up tolerance to wearing a new type of garment, rather than giving up first-go. And also to hear about the company’s quality care of clients, and quality production of garments. Lucia is an inspiration – good on her for working with you to get the best solution for her. You are all amazing – your strength and conviction. I hear you on the anxiety factors too. Such a tricky road to travel. Looking forward to reading your next update. So so happy you and Lucia finally came right with good fitting garments. And that red is gorgeous!!! They look perfect and how outstanding you were able to take her thoughts and feelings into account as she adjusted to the new stockings. Just wondering if you wear rubber gloves when you put them on, you mentioned having difficulty pulling them up. The rubber gloves help me tremendously with ease of putting my stocking on. (I am only wearing on one leg though so that might be the difference) best wishes for the future. Hi whenever we get new stocking they incudes a wee satin type sock to help ease the garment over Islas foot. I’ve opted for open toe as you know as her toes were getting infected with closed toe. So it easily pulls out once the garment is over her foot , there must be something equivalent for closed toe garments surely ??? Oh, never heard of this Heather! how does it work? We are still closed toe though we have now also got her toe caps as well to try out. Need to work out when is the best time to use them as it’s too much to wear those and her tights. I am so happy for you all! I know what a pain finding good garments can be. If she wears compression at night, you might check out E Z Medical Wraps. I am very short and they were able to make custom compression foam, a wicking sleeve and short stretches with velcro for me. I love mine. So easy and comfortable. Also, they have a special program for kids under 16. They are free of charge. Please tell Lucia that my tights match hers, and I Love them, too! (Maybe she doesn’t need to know that I am 50 something). Juno does such great work, and the quality control is impeccable. Congrats on garments that she loves to wear. Half of the battle for sure! Hi, I stumbled across your daughters blog through Joe Zuthers Facebook, I would love to follow her and offer any life experience I can offer, I have had it for 35 years and am always learning , especially to live actively normal and to avoid the elephant leg look , I was born with the next stage lymphadema precox, I always nicknamed your daughters stage “fat feet” you are so ahead of the game !!! I went six years before I could get anyone in my area to figure out how to help me , Hopefully will talk too? Love the tights ?